This Bible reference guide lists verses, passages and references for Scripture topics. 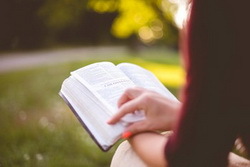 Listed alphabetically below are lists of verses by topic from the Christian Scriptures to help guide you to the Bible answers for your Bible questions. As with a concordance or topical Bible, simply look up a word or topic to find relevant passages and Scripture references. Scriptures to answer questions from the Holy Bible are listed alphabetically by topic below. Click on a letter to find Bible references and verses for topics beginning with that letter. MAN as provider (see also wives): Genesis 3:17-19,23; 1 Timothy 5:8; Ephesians 5:23,28-31; cf. 2 Thessalonians 3:12; 1 Thessalonians 4:10-12. Many Bible examples show men employed away from the home in such occupations as shepherd, carpenter, physician, fisherman, merchant, farmer, sailor, preacher, tentmaker, etc. SUICIDE examples (see also murder): Judges 9:50-57 (Abimelech), I Samuel 31:3-6 (King Saul), 2 Samuel 17:23 (Ahithophel), I Kings 16:18 (Zimri), Matthew 27:3-5 (Judas Iscariot), Acts 16:27,28 (Philippian Jailer almost committed suicide). Note that all instances were people not faithful to God.